According to the recently published LinkedIn’s 2017 U.S. Emerging Jobs Report, machine learning and Big data engineers are in high demand by various industries(both tech and non-tech). Big data and machine learning are not just buzzwords like in the past. Therefore, it is not surprising that several companies are competing against each other to leverage their potential in marketing. However, many have just a faint idea of how big data and machine learning can impact the future of marketing. So, let’s have a look. While big data is a voluminous amount of data that demand sophisticated tools for storage and processing, machine learning is a fascinating field of artificial intelligence (AI) that enable computers to act without the need of any explicit programming. Big data is also collected by sensors, log files, online transactions, and many more. Self-driving cars, virtual personal assistants (Siri or Alexa), real-time traffic predictions, and more. Now, let’s discuss how these technologies can have a profound impact on the future of marketing. Likes and shares no longer guarantee success in a distracted digital world. One has to devise and execute a smart marketing strategy to succeed. Big data along with machine learning help in improving the same with precision. The fact is that big data is massively unstructured and voluminous. Hence, businesses can’t analyze big data without the aid of machine learning. In near future, we can see more automated customer service. Insights from big data and machine learning have revealed beyond doubt that poor customer service is the main reason for not getting desired outcomes from a marketing campaign. Businesses will stop blowing their own trumpet from the roof-top. There will be no need to tell the world that their services or products are the best. Everything will become subtle in its nature and marketing will become smarter. As per a report entitled “The Programmatic Advertising Report” published by BI Intelligence, the overall RTB revenue will exceed $26 billion by the end of the year 2020. The report emphasized that both mobile RTB and video RTB are registering a rapid growth. Introduced way back in 2009, the concept of Real-time bidding (RTB) has gained prominence today because of the evolution of machine learning algorithms. The bidding variant helps advertisers to buy and sell display ads in real-time as per some pre-specified parameters. The RTB process is an auction setting in which every transaction takes less than 100 milliseconds! You can just imagine the terrific speed! After all, we need 300 milliseconds to blink our eyes. At present, advertising professionals use internet advertising with an aim to reach target customers without spending a fortune like in the case of offline advertising. How will real-time bidding help in online marketing? RTB will help digital marketing professionals in a myriad of ways. Some businesses now use popular RTB platforms like DoubleClick Ad Exchange of Google to harness the power of machine learning. 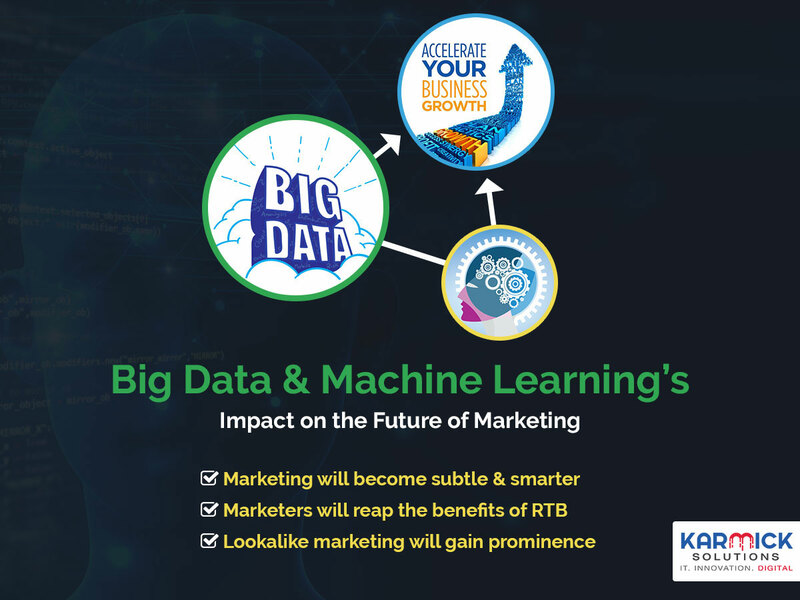 However, the future seems bright for other RTB Platforms too with more businesses realizing the potential of machine learning and big data in marketing to achieve a higher rate of success. You might have familiarity with the ‘lookalike audience’ feature of Facebook. Lookalike marketing is a type of marketing in which marketing professionals find new customers by machine learning. Lookalike marketing will become popular in the coming years. Businesses will need lookalike marketing to acquire a new customer base to survive in a fiercely competitive world. At present, most businesses across the world use Facebook for lookalike marketing in a cost-effective manner. Apart from Facebook, there are several sophisticated tools called Data Management Platforms or DMPs. These DMPs use machine learning to find people who are like your existing customers. In a nutshell, big data and machine learning will have an enormous impact on marketing by unlocking the mystery of customer psychology like never before.